When Picasa 3.5 came out, I was fascinated by their facial recognition tool. 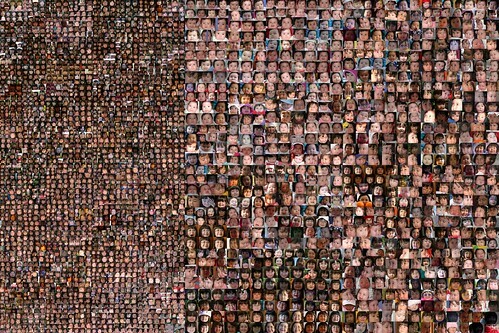 I created name tags for everyone in our family and let Picasa try to pick out our faces from our collection of over 27,000 photos. For the most part, it did an excellent job of separating us by face, but Adam and Dova often got mixed up. Once in a while, a blonde-haired blue eyed girl would also end up under Adam's tag (an alter ego perhaps?). As Picasa worked its magic in the background, I would occasionally go back and fix the wrongly tagged people. 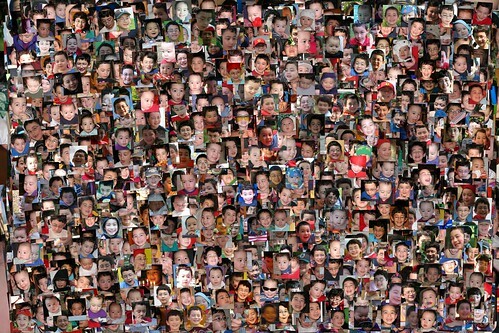 After 3000+ photos of the kids were tagged, I tried out the collage feature. Here is a "Picture Pile" of Adam. Click to see Adam's collage large. Wow! It's great to see him morph from baby to nine years old. Click to see Dova’s collage large. Dova wanted to use the mosaic option. Three thousand photos make for teeny tiny mosaic tiles! !